George Bush actually wrote a book…. sort of a confession to be used in an upcoming trial at the International Court of Law (hopefully). Everything he wrote can and will be used against him. In the book he wrote about his legacy to America; But, it is based on lies, deceit, crimes of war and against humanity, and complicity in criminal fraud, a disgusting record deserving denunciation and prison, not shameless feting. Also in the book; G.W. 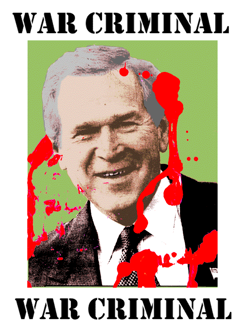 Bush recalls that when the CIA asked him whether they could proceed with waterboarding of Khalid Sheik Mohammed, the alleged plotter of the 9/11 attacks, Bush replied “Damn right,” reported the Washington Post. It’s Kafkaesque to imagine this scenario in Guantanamo as they set up the waterboard to nearly drown their captives. CIA interrogators used the controversial waterboarding technique 183 times on Khalid Sheikh Mohammed. So, it looks like we have two here who will be standing trial…. I didn’t touch on his seek and no find of WMD’s in Iraq, but forged ahead with a war just the same, not to mention execute the rulers of that nation. Also no mention of the many unanswered questions regarding his role in 9/11…. But, he himself talks about those things. Also not mentioned by me is his war on the civilian population of Afghanistan or his support of the genocide of the Palestinian people….. the list is endless. The book was obviously not written by him, so this might turn into the first ‘ghostwriter’ confession in the history of the legal system. Should be an interesting trial as he claims “I didn’t say that”…. but it’s all there in his book that says it was written by him. Mamma B can be mighty proud of her youngin. I am not in any way suggesting that you go out and buy the book…. the last thing I want to see is him make a profit from the suffering he inflicted on humanity, just thought you might find it interesting that a book written by him (sic) does exist, but then again, so does the Easter Bunny. Yeah now, how does our world get the Bushco to the ICC? Should we wait on Eric Holder to work justice as Amerika’s Attorney General? Ummm, that would be sort of a rhetorical question. Yup. Eric Holder, lickspittle extraordinaire. I would submit for parliamentary review and a ‘second it’ notion, gits up a posse of committed radical dissidents and then sends ’em deep underground for a mite so’s the “heat” dies down just a wee-bit and then and then, grab the Texas bourbon-boy and RENDITION his sorry behind to the Hague where he can stand trial for war crimes and crimes against humanity. Recall he stood at the Knesset and said – “Here I am in the promised land with the chosen people.” Heck of a premise to underscore American interests.